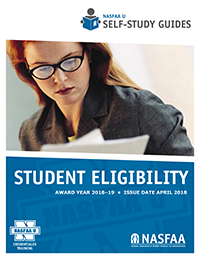 This guide provides an overview of general student eligibility criteria and documentation requirements, acquaints participants with the role of the Central Processing System (CPS), the student eligibility database matches, and the National Student Loan Data System (NSLDS), as well as how certain educational programs affect student eligibility. Learn the categories into which the general student eligibility criteria fall. Know how to resolve problems with database matches. Recognize examples of fraud and how to report it. Understand how changes in eligibility impact the receipt of Title IV aid.